Can Magic Beans trash any number of cards from your hand? Then it seems a bit too good compared to Cemetery. I can see your point. Let's try this. This is extremely strong, which is not necessarily a No-Go. But I would rather try it with 10 copies, because with only 5 copies, it is extremely advantageous to be P1, especially with 4 players. This has probably been more a challenge for me than you, so much analysis to do with split piles! Well done all, there are some great designs here. I feel I didn't have the time to properly, fully analyse each one but they're all considered. So, in looking for good use of the split pile mechanic, I was wanting to see convincing reasons for players to contest the pile, good involvement of the timing each card appears, interesting manipulation of the pile, a definite synergy between the two cards that isn't independent, and all the other things making the Empires split piles meaningful. Not bad, this one. Cursing goes well in a split pile. The synergy between the cards is sound yet not so close that the pile can't interact with others; possibly a bit too complete a big money strategy. Dragonfly is in a tough spot price wise though, maybe if were a bit cheaper and weaker it could let players contest them easier, and let the crows fly sooner. There are good design elements in this pile. Banker needs at least 2 Investments without other Durations, which creates some competition for the Investments. But as holunder said himself, there are risks with how strong it is. 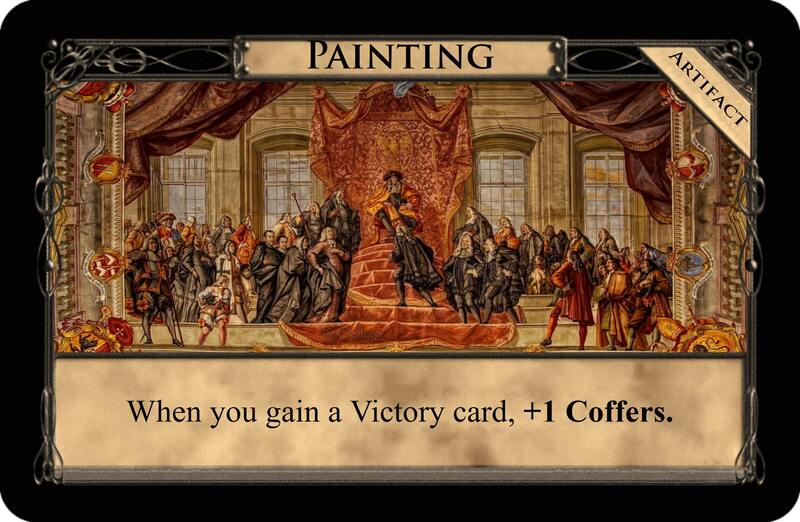 Investment hoards Coffers, and 3 Investments could be a win condition. Another snag is Investment feels like it should be an Action as it doesn't give immediate benefits. This one was certainly popular. It has a great first impression and follows the principles of a good split pile very well, but I fear the pile synergy is a bit too close and too strong. +2 handsize +1 Action +$1 across 2 cards, better than 2 labs; they each cost $5, whereas these are just $2 and $4. The Crowns are certainly hot competition, possibly they're worth $4 as they're close to a peddler but they're good fun at $3. Then the Queen; the Action bit is bad, but lets her Throne herself. It's convincing, but possibly Queen is a bit weak? Could she be $4 even? Cobalt very nicely fuels the Kobold, and it makes a fun race to buy the first Kobold like Gladiator to Fortune. There is the gift of Copper trashing for opponents though, which could be minor as it comes from hand; and the first Silvers are nerfed with their money density being the same as Copper, so less likely bought, but sometimes opening Silver has to be done to hit $5 and it adds a +Buy. Yes, this is promising. Very similar to Wages/Day Labourer. It may not have as exciting a first impression, but it's safer. Contract will probably be contested more than Wages, but I agree that it's a bit cheap, because a Treasure giving a Villager is very, very good with terminal draw. Also means Bookkeeper being draw to X is a good move, you only get the crazy non-terminal draw once unless you work for more. Sound design. There might be something going for the basic idea of this pile, but these cards are rather weak. Surplus is a bit steep for what it does, and Glutton is a very expensive Peddler only doing better than one a very few times. Golds to hand aren't that good. To trash Garrison to Shilling you have to not play it, so the synergy is weak. Using Garrison as a gainer is awkward as it comes in late. And I feel Death Cart does what Shilling tries to do much better. A few issues with this, the most prominent being that 2 Lost Cities, 2 Smelters and 1 other cantrip can play infinitely. Train the Lost Cities for infinite $ and Buys, gain the Supply. Similar to Magic Crown/Vampire Queen. The synergy is weaker, since the discard pile is unreliable. This whole pile seems to revolve around the King's Court bit on Hunt, which is non-terminal but has a lot setting it back; it's on a Duration so it's every other turn, sometimes you have to avoid playing the Action this turn to set it aside, and candles are Treasures getting in the way. Players will only want to buy Moulds for their +Buys, situationally for making into Gold. So Smelter will rarely appear, and when it does the best it usually gives for payload is Woodcutter, trashing Coppers or Moulds that could have been played for $2. And as a trasher it comes in too late. When Treasures are a relevant strategy, Horse can make for a competitive top card, but you have to be even more careful than you do with Lurker because nobody minds a Gold. Possibly players would rather buy a Silver to be safe and reliable. Paddock is strong and worth emptying horses for, maybe too good with big money decks? Very mathematical. Looking at why and when you'd buy each card, Credit at the start is a Copper trasher but compares unfavorably to most other trashers, so if they're in the game you'd ignore Credit at the start. To get tokens from it, you'd want it later on and have the cards to trash to it; Silvers I suppose are best, you can pay the debt off easily. So, I don't think Trader will appear very often, and it's a bit too dependent on Credit to work; if you have no debt it's nearly useless. The bottom cards of the official split piles can be used fine without the top. So this premise doesn't really suit a split pile. This is an interesting format to be sure. The viability of Medallion is put into question with Villagers being so good with Goldsmith's draw, and with a Copper, Silver and Gold in hand you can buy a Gold (I assume the reveal is from hand, it isn't actually stated) so a lot of Villagers are needed to make it a sensible buy. It might overall depend on other sources of Villagers to work. Goldsmith by itself could be a nice card if it's balanced. Tool looks very scary. Line two up to trash 3 cards, then after trashing they make themselves lesser Fool's Golds that line up very easily. And they cheapen Anvils. I see that this pile is very dominant very often, all you need is a Village and this is practically a complete strategy. Definitely too heavily nerfed. Gilt is very slow Copper trashing, and only when there's no kingdom $2 pile, so other trashers are preferred. They empty very slowly, if at all, revealing Salt the Earth in portrait form; it's rather unimpressive as a generic source of VP. You'd get this if you're comfortably ahead, but will you be if you've played a very slow game with Gilts? Number of copies sensible, but there's so much going on here I hope I have it all right. It all hinges around the cost increase on Treant. Timberland might be wanted enough to reveal it, change a copper to a $3 with 1VP. When revealed you can get a $5 (which can't be Duchy), unless you return Timberland to hide it again so you get a $3. All quite neat, but is there synergy between Timberland's gaining and Treant's wanting nice victories? Not really, the only link I see is liking sifting, which may not be present. And Tunnel, the same. Balance? Hard to tell, but Treant doesn't look very safe. I'm not sure Beans will be bought enough to make Beanstalk appear that often, including the ones Beanstalk returns. Shortlist: Dragonfly, Magic Crown, Cobalt, Contract, Pheasant. Congratulations on a challenge well answered. Renaissance was missing an alt-VP source, maybe we can fix that? The next challenge will be: design a Victory card. Bonus points will be given for one that could plausibly have appeared in Renaissance. A fun pile that puts a new spin on cursing and how and when to trash down. I don't expect to win at all, the text is too small amongst other things. I could have used Grand Market's wording for the gain condition, but I just wanted to avoid the confusion with buying a card yet not gaining it. Can it be a card shaped thing like a project? Worth 1 VP per 2 cards you have of whatever type you have the third most of. I don't think so, because then it wouldn't be a Victory card. 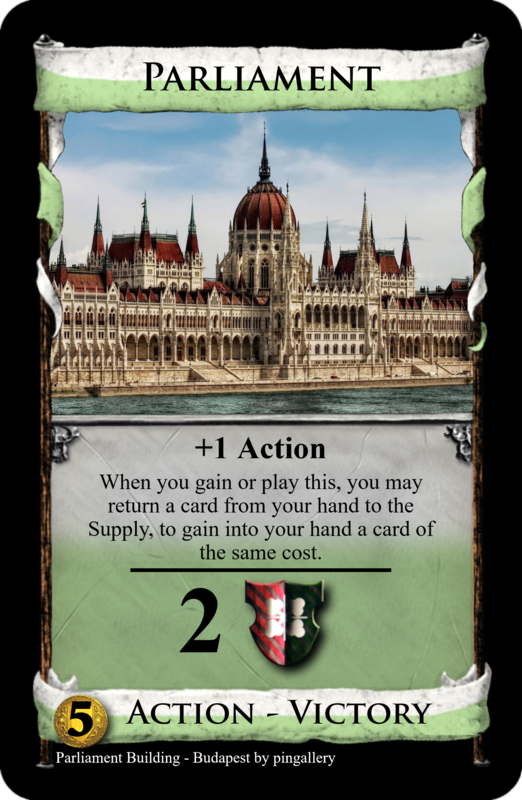 Edit: Renamed to Parliament, modified wording to make it clear the gained card is put into your hand. Sweet, I made the shortlist! Thanks! (If it's a tie, count either). Also maybe $6 for the 2nd most common type would be better. 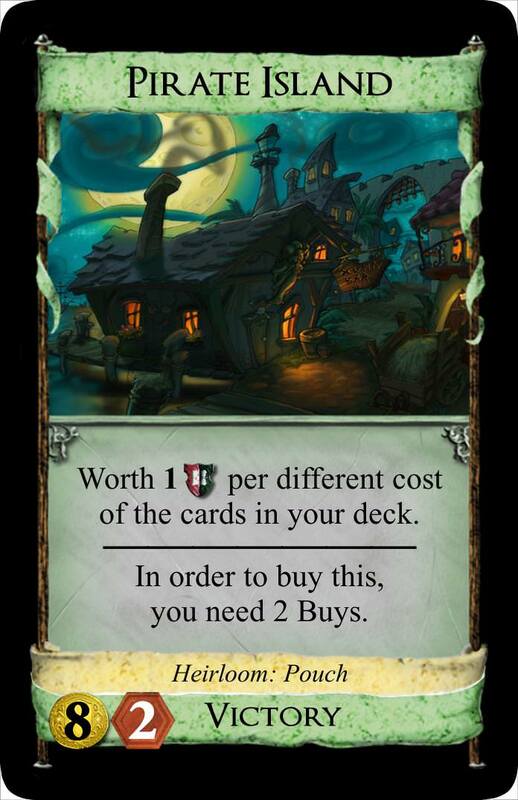 As in, if there are two card ideas which are approximately equal in quality, preference will be given to one which I think could have been included in Renaissance. It's an interesting idea, but I'll stick to the original wording and say that it has to be a card with the Victory type. There's already a card (well, a Landmark) called Fountain. Oops! Renamed my entry to Parliament. Nothing from Renaissance, only stuff from Empires and Nocturne, but what can you do. The purpose of the Debt cost is to make this ungainable except via buying it which is the only way to make the Buy restriction work. Gain restrictions would obviously run into issues. An alternative wording, similar to Grand Market, would be: "You can’t buy this unless you spend an extra Buy." 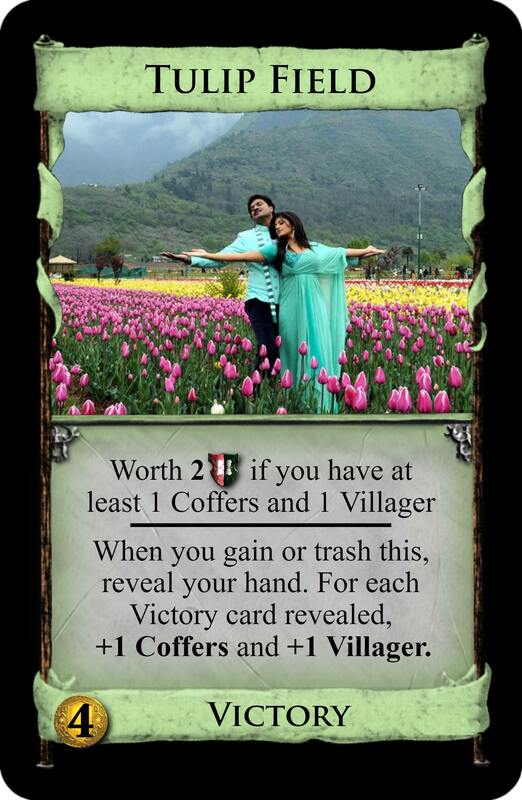 Trying to something Renaissancy so uses Villagers and is a good tbf target as well as a tbf card itself. Originally it gave you a choice of Coffers or Villagers but that was kind of crazy (it cost $5 then though). The Villagers part seemed like the fun part so it's just Villagers now. Congratulations hypercube and thank you for your nice topic for a new card. So, this is an easy one. Enjoy! When you gain this, gain a non-victory card costing up to $5. Note, that this plays very different than Banquet-with-Estate. It triggers on gain, so you can combine it with Workshop, for example. It also provides nice trash-to-benefit fodder due to its higher cost and cannot be exploited with Ambassador. Also having a separate pile prevents, that the Estates are emptied early, especially when there are nonterminal +Buys, like Villa, Market, Festival, Spices, etc., in the kingdom. To me, a major mechanic theme for Renaissance is trash for benefit. It has more tfb cards than the usual expansion: Improve, Research, Recruiter, Priest (kind of). 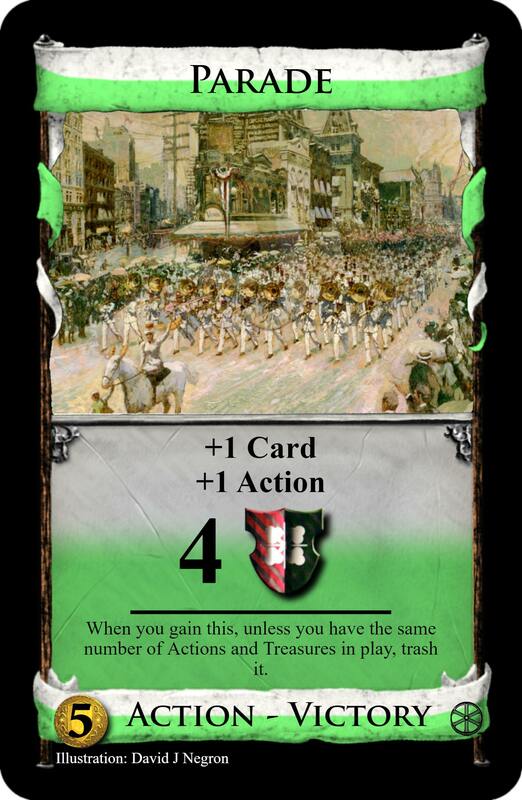 Also, cards like Lackeys, Flag Bearer, and Silk Merchant, with on-gain and on-trash benefits go well with trash for benefit. So what do trash for benefit cards like, that Renaissance doesn't have? A silver gainer! * Also, sifting to match the tfb card with the cards you want to trash easier. 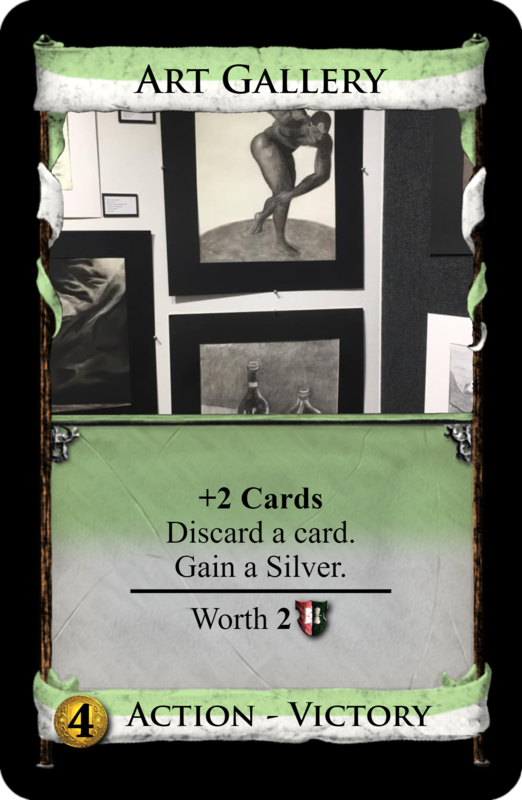 I thought about making it give 1 for every two silvers in the trash (or something like that), but people would complain that it could appear on a board with no trashing (Here's where I restrain from giving my 'why do people assume full random for fan cards' rant**). *Actually there's Sculptor which is kind of a silver gainer, but I forgot about Sculptor when I was thinking about this. oh well. The purpose of the Debt cost is to make this ungainable except via buying it which is the only way to make the Buy restriction work. You can still gain it though, by Stonemasoning a Fortune! Some Renaissancy VP card. Sorry LA for the name doubling, I found it hard to come up with something else. 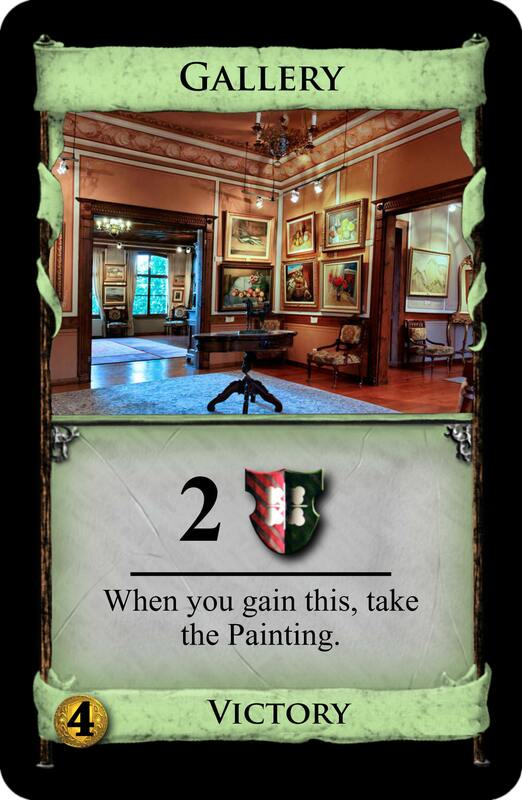 Clarification: Painting already affects the Gallery you get it with. After playing a Highway, Farmstead/Border Village looks a bit too crazy. This seems a bit too strong as a BM enabler. You can gain 2 Silvers each play, for $4. This is better than JoaT for BM, and it provides you some extra VP. Yay, I like this challenge. Sadly somebody has already posted something similar to my idea (Victory card that gives out an Artifact), so I'll have to see whether I can think of something else. 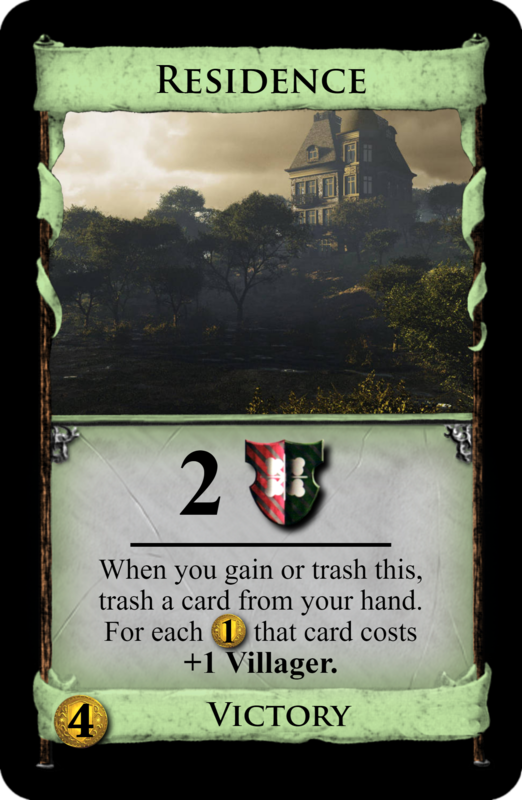 When you gain a Farmstead for the first time this turn, gain a non-Victory card costing up to $5. And yes, it is thematic. 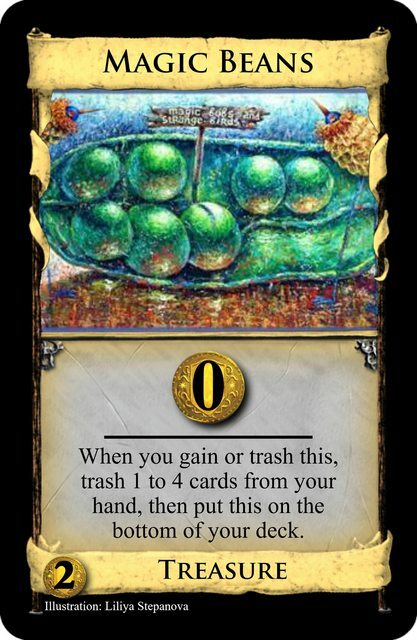 Renaissance has many cards with "When you gain this". Also note the synergy with Inventor and the many trash-for-benefit cards which can get rid of Farmstead, if you want.